develop a major carbon position and representative attendance from China, this year Country Guest of Honor. “The Asian Composites market amounts to $44.28B (Singapore dollars). In value, it represented 43 percent of the worldwide market in 2014.
the Asian Composites market is its complexity and heterogeneity. Asia needs an international platform to present this diversity. JEC Asia plays this unique role.” adds Mutel. addition, networking sessions were organized outside of the convention hall to maximize the opportunities for meetings such as the exhibitors and VIP gala, the Chinese reception as Country Guest of Honor, or again the Composites Tours sites visits at TEMPCO Manufacturing and Singapore Polytechnic. 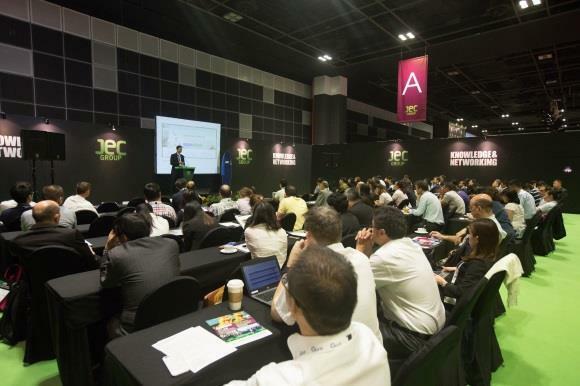 Another key event during JEC Asia was the Aerospace Composites Circle featuring Laurence Barrett from Barrett Aerospace presenting a speech about Composites Design, Manufacture and Repair. The Aerospace Composites Circle in Singapore aimed to use the best global capabilities and talents to meet local Asian Aerospace composites needs.